John Pollock goes through Saturday's UFC on FOX card from the Amway Center in Orlando, featuring a second-round stoppage victory by Jeremy Stephens over Josh Emmett that was heavily-debated following a controversial closing sequence of the strikes that led to the finish. 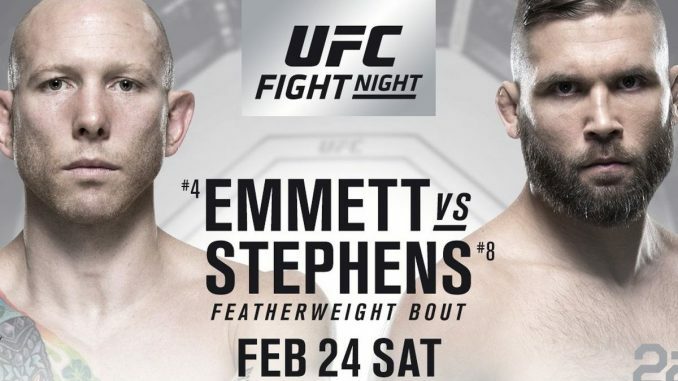 On a night where Jeremy Stephens earned his 15th victory inside of the UFC and third consecutive win within the ultra-competitive featherweight division, the talk was not of Stephens’ title aspirations as he closes in on his 12th anniversary with the UFC, but rather a series of fouls that overshadowed the fight-ending sequence with Josh Emmett. After being dropped in the opening round, Stephen rebounded in the second, dropping the 32-year old Team Alpha Male fighter with a left hook and sensed the end was near. As Stephens pounced on Emmett, he dropped elbows, two of which appeared to land behind the back of the head but without acknowledgment from referee Dan Mirgliotta. Stephens then wound back his knee and came razor close to blasting a downed Emmett with the knee, which based on your angle of the replay either grazed the head of Emmett or just missed. Stephens proceeded to get on top of Emmett with several fight-ending elbows, becoming the first man to stop Josh Emmett and scored the knockout finish at 1:35 of the second round. In the state of Florida, while the newest rules from the Association of Boxing Commissions have been adopted, instant replay has not, and therefore the validity of the illegal strikes was left to the viewer at home to decipher and would not be challenged and decided upon inside the arena. This led to an interesting discussion on the FS1 post-show involving color analyst Daniel Cormier with Michael Bisping and Dominick Cruz on the studio desk. Cruz, who is a teammate of Jeremy Stephens’, began the post-fight chat by acknowledging the illegal elbows but felt the knee in question never landed and wasn’t a point of contention. Cruz also welcomed the need for instant replay and wished it was at disposal of those in charge of a fight. When Cormier joined the discussion, it became much more animated with Cormier arguing that contact was made with the knee and Cruz disagreeing as fans watched the replay from multiple angles to draw their own conclusion. At the end of the day, it lays at the feet of referee Dan Miragliotta, who did not make the call on any of the fouls and any protest by Josh Emmett isn’t likely to result in any change to the outcome of the fight. Emmett’s team did inform MMA Fighting’s Ariel Helwani that they would “absolutely” file an appeal. The UFC showed no resistance over the outcome, awarding Stephens with a “Performance of the Night” bonus for $50,000. What was glaring is the audience at home and the analysts calling the fight all had the benefit of utilizing replay but the most important party to the fight, Miragliotta, did not. Human error is a part of mixed martial arts officiating and a case can be made that Miragliotta made several in the closing moments of the fight. This was a textbook example of the need for instant replay following a fight-ending sequence. Last October, the New York State Athletic Commission implemented the use of instant replay following a fight-ending sequence for the in-cage official to view and make a ruling on. A fight cannot continue after instant replay has been used. With the victory, Jeremy Stephens improves to 28-14 and has won three consecutive bouts at featherweight, including two in 2018 following a stoppage of Dooho Choi on January 14th. Former strawweight title challenger Jessica Andrade continued her campaign for another opportunity at the championship, earning a unanimous decision over Tecia Torres on scores of 29-27, 29-28, and 29-28. The entertaining three-round affair saw Andrade utilize her strength for continual takedowns throughout the fight and landing power shots early in the fight to disrupt Torres’ strategy of being the faster of the two and landing in high frequency throughout the opening minutes of the fight. Andrade dropped a five-round unanimous decision to then-champion Joanna Jedrzejczyk in May 2017. Since the loss, she has earned victories over Claudia Gadelha and now Torres, while Jedrzejczyk was unseated as champion last November at UFC 217, but is due for a rematch in April with champion Rose Namajunas. In a light heavyweight bout, underdog Ilir Latifi snapped the three-fight winning streak of former title contender Ovince Saint Preux with a devastating standing guillotine that put Saint Preux out cold. Referee Jorge Alonso was on the opposite side and missed Saint Preux’s tap as Latifi dropped the limp body of Saint Preux to the canvas at 3:48 of the opening round. Latifi made his case for a light heavyweight title fight in his future, addressing champion Daniel Cormier cage side. Cormier is earmarked for a heavyweight championship bout with Stipe Miocic on July 7th and isn’t likely to be defending the light heavyweight title until late 2018 at the earliest. Latifi can be satisfied with his performance earning him an additional $50,000 for the second “Performance of the Night” bonus. The FOX main card opened with hometown favorite Mike Perry representing Orlando for the 10,124 in attendance at the Amway Center against the card’s biggest underdog in Max Griffin. Griffin was not affected by the one-sided nature of the audience, cutting the Orlando native on the forehead during an early exchange and keeping Perry at distance with his jab work. In the second round, Griffin made a statement by dropping Perry with a left hand and forcing Perry to go for broke in the final round to land the home run shot to satisfy the audience, who were left wanting as the fifteen-minutes expired. It was not in the cards for Perry, as Griffin won by unanimous decision on scores of 30-27, 29-27, and 29-27 as the plus-280 underdog improved to 14-4 and recorded his first octagon victory since November 2016. The “Fight of the Night” bonus was awarded to welterweights Alan Jouban and Ben Saunders for their undercard bout. Jouban knocked out Saunders in the second round after an inside leg kick set up the fight-ending left hook to Saunders.